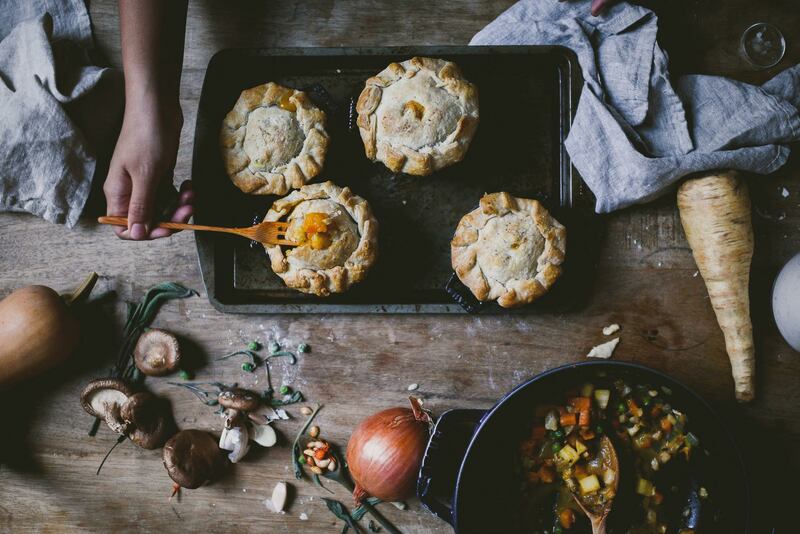 I’ve always had pot pies in mini-form. 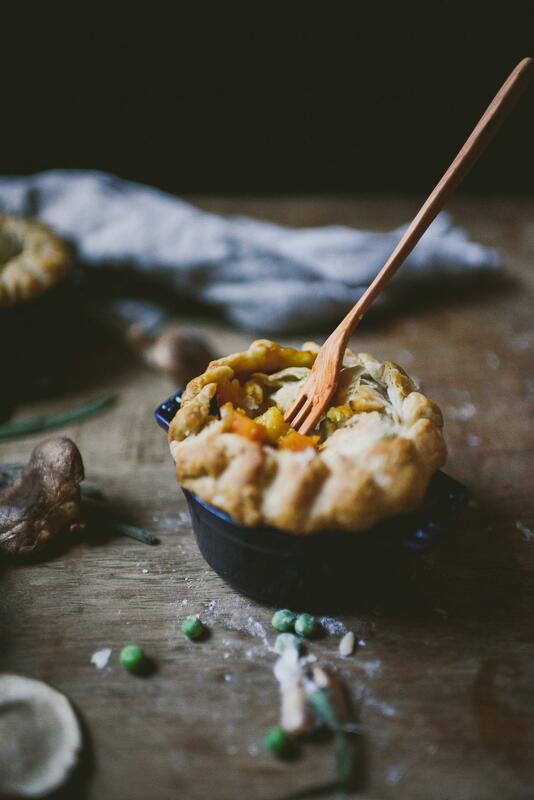 Pot pies are so cozy they deserve to be packaged individually (which also means more crust per serving), so that each dinner guest can savor their own pie. I could honestly eat two of these in one go. Much like with creme brûlée, the first bite is always the most satisfactory. The breaking of the flaky crust allows steam to escape rapidly, and the bright root vegetable filling gets to peak out and exude its sage-y fragrance. 1| Prepare: Cube butter into 1cm pieces, and place it in a bowl in the freezer. I find that this allows the butter to get very cold before you work with it. Put water in freezer as well. Don’t worry about it freezing- you will use it before it can freeze. 2| Combine flour, salt, sugar, black pepper. 3| Take cold butter, and using a pastry cutter, fork, or fingers, work quickly and cut butter into dry ingredients. Pea size chunks will remain, and that’s completely fine. 4| Take out water. Using tablespoons at a time, mix it into dry ingredients until just combined. Do not overmix or knead. Add the mixture gradually – you can always add more water, but you can’t take it out. The resulting dough should be damp but not moist. 5| Separate dough into two parts, with one larger than the other. I divided it into 2/3 and 1/3 discs. Shape into disks and wrap with plastic wrap. Place in fridge. Let dough rest for at least 1 hour. 2| Remove and let cool. 4| Heat a heavy bottomed pot over medium heat. Melt 2 tbsp of butter, and cook onions and garlic for 5 minutes, until onions are translucent and soft. 5| Add in mushrooms and cook until mushrooms begin to release their juice, approximately 5 minutes. 6| Stir in chopped sage. 7| Move the mushrooms and vegetables to one side of the pot and add the remaining 1 tbsp butter. Add flour and whisk to combine. Cook mixture for about 30 seconds, until it is fragrant and nutty-smelling. 8| Slowly stream in stock and stir constantly. Lower heat and cook for about 10-15 minutes, until thick. Add salt and pepper to taste. 9| Gently fold in root vegetables. Add frozen peas and crème fraîche and cook together for a minute, checking for seasoning. Remove from heat. 10| Cut each disk of dough into four pieces. Line mini-cocottes: Roll out dough to about 1/8″ thick and gently place over the surface, with about 1″ overhang draping over the edges. Make top crust: Roll out dough to about 1/8″ thick and use a cookie cutter or bowl to cut out rounds that are slightly larger than the opening of the mini-cocotte. 11| Spoon root vegetable mixture into the cocottes. 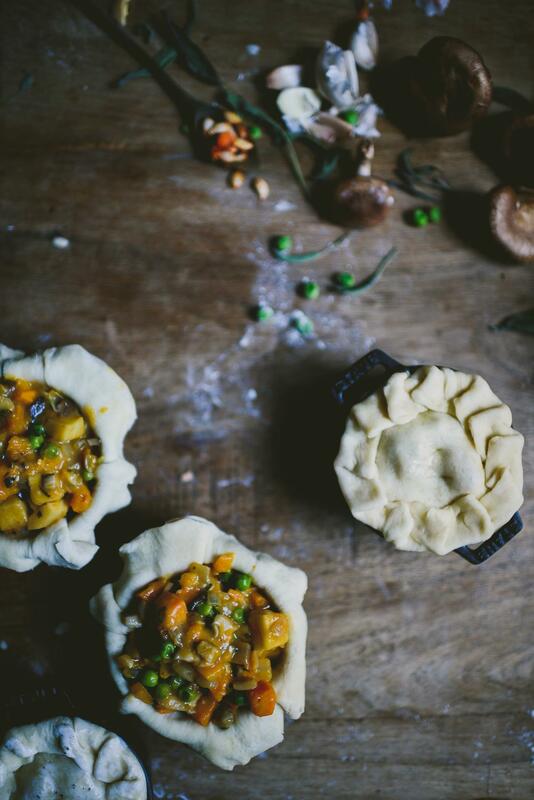 12| Place disc gently over the root vegetable mixture and gently crimp the overhang of the bottom crust. Slice two slits over it, and put in fridge for 10 minutes. 13| Brush generously with crème fraîche wash, sprinkle with salt and black pepper, and bake for 30-40 minutes, until golden brown and flaky!